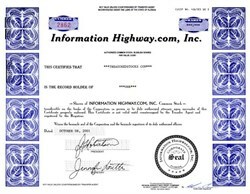 Beautiful certificate from Information Highway.com, Inc. issued in 2001. This historic document was printed by the American Banknote Company and has an ornate border around it. This item has the printed signatures of the Company’s President, John George Robertson and Secretary, Jennifer Lorette and is over 10 years old. For Immediate Release: Vancouver, BC -- May 26, 1999 -- Information-Highway.com, Inc. (OTC Bulletin Board: IHWY) announced today that they are now offering innovative and customizable dial-up Internet access as well as Executive Portal Site services to several large U.S. cities including Seattle, Denver, Dallas, and Houston, commencing immediately, using Level 3 Communications' (Nasdaq: LVLT) advanced Internet backbone network. This is the first phase of Information-Highway.com's twenty city rollout program in the United States, designed to aggressively expand its presence in the U.S. market. Information-Highway.com will be offering several value-added services for its dial-up customers, including multi-casting technology through a strategic alliance with Broadcast.com (Nasdaq: BCST). The Broadcast.com website partnership allows Information-Highway.com's users convenient access to a large and comprehensive selection of programming including, sports, talk and music radio, television, business events, full length CD's, news and live special events. In addition, as an additional value-added bonus to its users, the company is planning to offer free Internet-based long distance service to its dial-up customers. These free Internet-based phone calls can be performed in the exact manner as traditional long-distance telephone calls using an ordinary household telephone. The Company will implement its free IP-based long distance service for its Executive Club clients (http://toronto.theexecutive.com ) / (http://vancouver.theexecutive.com ) within the next month in Toronto and Vancouver in Canada and the free long distance service will be launched in several major cities in the US over the next few months. Information-Highway.com Inc. is a leading Internet Service Provider (ISP) engaged in web content development and Internet access. The Company provides dial-up and dedicated Internet access as well as web site hosting to over 20,000 Canadian users. Information-Highway.com's premiere online service, The Executive Club, is a localized regional Internet portal that can save users vast amounts of time by allowing them to access stock quotes, weather forecasts, community events, online trading, web searches, multicasting, free long-distance telephone calls, and shopping -- all from one place. Information-Highway.com's premiere online service, The Executive Club, is a localized regional Internet portal that can save users vast amounts of time by allowing them to access stock quotes, weather forecasts, community events, online trading, Web searches, multicasting, and shopping -- all from one place. Interested parties may join The Executive Club for free at http://www.theexecutive.com and can find more information about Information-Highway.com Inc. on the Company's web site at http://www.information-highway.com. Information-Highway.com has been featured in Internet Stock News (http://www.internetstocknews.com), one of the web's leading publications for Internet investors.